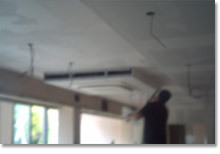 Astryan are also involved in Property maintenance, incorporating the building maintenance under our management. 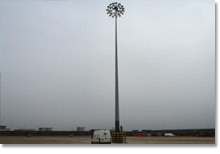 Astryan carry out decoration to Specialist High Mast Lighting throughout the country. 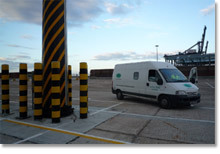 The masts can be up to 40m in height with specialist protective paint system applied. Hazard Markings are applied to the base of some High Mast Lighting to give added visibility of the mast. 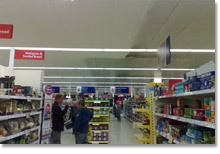 Astryan are able to carry out the Ames Taping as well as the decoration giving the client a package without the need for two separate contractors. 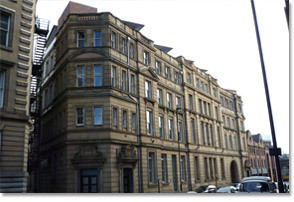 A project carried out for Robertson & Simpson on behalf of UK land estates , Astryan undertook building repairs to brickwork, stonework, render, joinery and the installation of the bird wires for pest control. 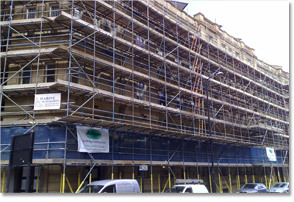 An independent scaffold was erected to carry out the works.